Looks like you have a nice model there! You might want to have a quick look at the valve-gear – it looks a little out-of-line, it might just need tweaking back into place. I don't have a very large collection of models, but a large percentage of what I do have will not run on 1st radius curves. A few struggle of 2nd radius too. I find the only models which will run successfully on 1st radius are either 0-4-0, or old triang models with flangeless centre axles. I don't think I'd attempt to modify your model – it is a nice large engine, definitely one for the larger curves. I'm afraid I agree, modify the layout, biggest radius curves you can possibly manage. Maybe do some testing with the loco first to see what it WILL manage. Have you checked the back-to-backs between the flanges? How bizarre! If this is a Stanier 4P, then this very subject was mooted at a recent lunchtime chinwag at the SDR, where it was suggested that the complainee [?] might fold up a new for'd 'truck' from suitable material leaving a couple of millimeters extra side play for the axle. Worth considering? It doesn't seem to be such a difficult job...? For my money they ought to go back to using blind (or else more compensated)center drivers and more compensated pilots where necessary... It's hard to tell a flanged from a blind when a loco's on the track, especially when it's moving. People complaining about unprototypical blind drive wheels and compensation on operating models is, in my books, a very foolish thing that the manufacturers ought to have rebuffed rather than pandered to. It's a miniscule compromise in appearance that results in huge - and vital - gains in function. If you care that much more about looks than function, why not just go build a static model? Yes, you need much bigger radii. At least a second and probably third. Most rtr models use notched cylinders to allow the pony truck to go around. 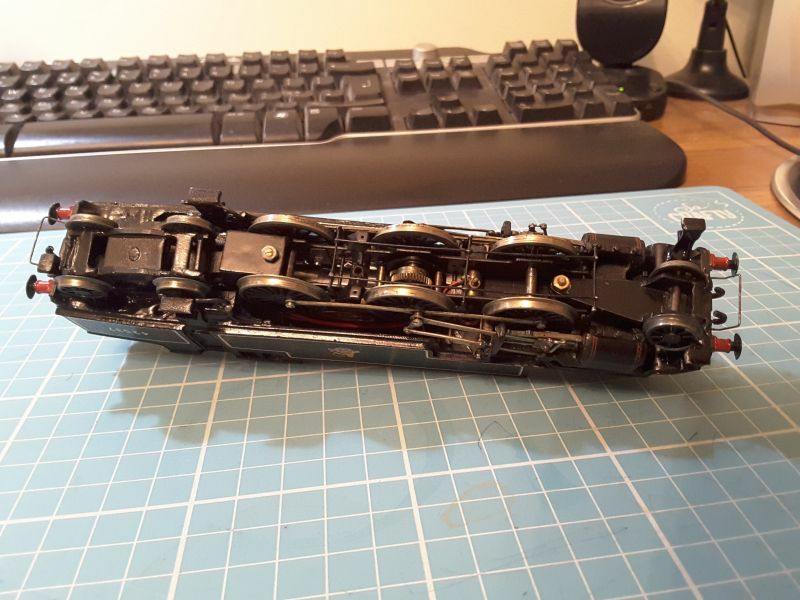 One of the issues with OO models is the angle of the rods and valve gear relative to the body, a result of the underscale track - 16.5mm instead of 18.62mm. The middle geared axle should have some lateral movement, and should slide easily along the rods. From the photo the rod hole looks oval and the rod is bent. Looks to be a well travelled older model. It looks like the pony truck has had some additional work done recently. The wheel flanges on the trucks are pizza cutter vintage, that may give you some problems with modern points as they go through the frog. The flanges on the drivers look to be finescale, and unless the track is perfect will derail at the slightest opportunity. The trucks are what keep the locomotive in the track. Is there any compensation? Interesting connecting system at the ends. Whilst I am in agreement with the above contributors who advocate larger radii, I would be thinking more in terms of an ACTUAL radius, not "1st" or "2nd". This label is very Train Set. Most producers of kits (and I am guessing from the photos that you have a kit-built engine there) suggest a minimum radius of 24-30 inches. When you consider that 3rd radius is under 20 inches in OO gauge, your engine is going to need a bit more real estste to be a reliable runner. Yes it might squeak round 20 inches but I would rather it ran in expectation than in hope when it came to the corners!! On your other point, I like Bredon as an idea but whether you could build it using 24 inch radius curves will depend on the amount of space you have at your disposal. Its a great plan for a small scenic layout. Then again you could use 2nd/3rd radius proprietary track, RTR locos and put your 2-6-4T on eBay!! I will have to bow to the wisdom of other members here whose knowledge and experience is far greater than mine. All I do know is that 1st radius curves are too tight for most things and always look too sharp. My own tight curves are 2nd and 3rd radius but with a length of straight in between the loop of my oval which gives the impression of a big sweeping curve but also allows all of my engines and coaches to navigate the track without problems. So far! I didn't have the room to have huge curves from flexible track, so this was my compromise, but it has worked out ok. Looking forward to seeing more of your layout, I'm always in need of a bit of inspiration! Welcome to the club Mike from me down on the edge of the Solent. Thanks for your comments on my first post, I'm sorry it has taken me a while to respond. 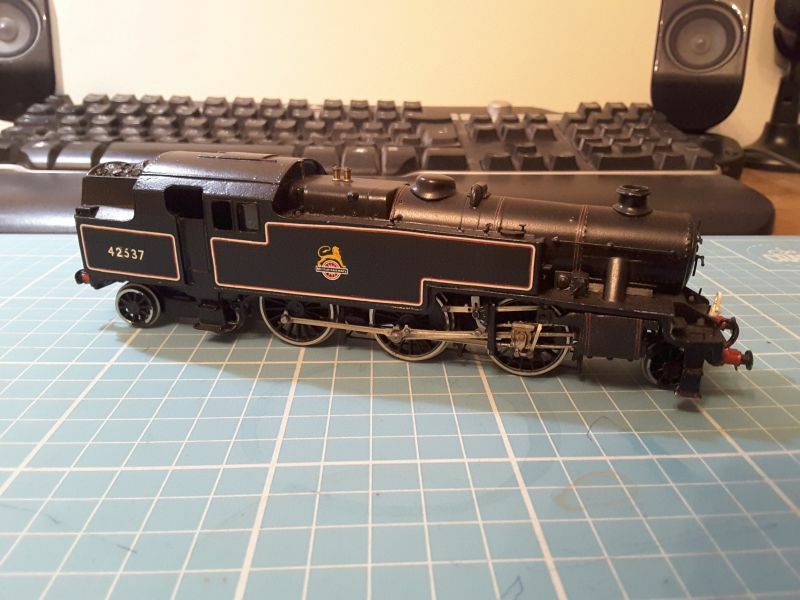 I'll check the motion when I eventually service the Stanier 2-6-4T loco and make sure it is correctly aligned. Since my first post here, I've purchased the AnyRail software and I've been using it to redesign Peco’s ‘Bredon’ layout on which I plan to base my layout on, but only using only 2nd and 3rd radius curves. It'll be laid with Peck Settrack. It is going OK, but I have a couple of gaps to close, I may have to sort these by using some flex track. My 8’ x 4’ baseboard made from Sundeala board is ready - all I need to find is some time! You are here: Your Model Railway Club > Welcome To Your Model Railway - New Members Area > Welcome to all new members > Hello!